Negotiate like an expert and get the salary you deserve! "You will never make money faster than when you are negotiating!" 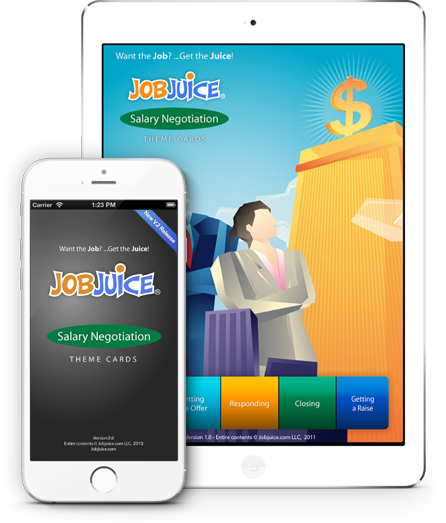 The Salary Negotiation App is a key tool for getting a great starting salary or salary raise. 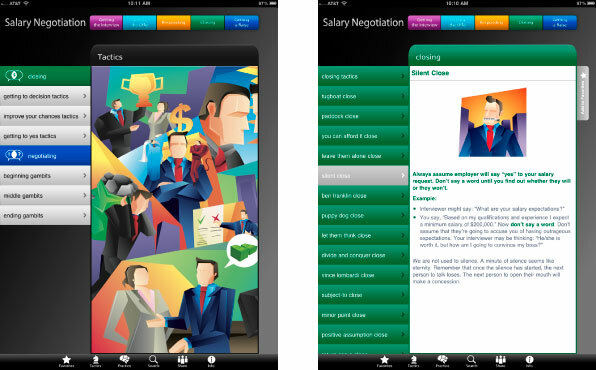 The app covers all the stages of the job search, interview, offer and salary negotiation process and provides a wealth of expert closing tactics and gambits to help you gain the upper hand when negotiating your future income. The Salary Negotiation App teaches you how to become a powerful yet professional negotiator and helps you gain an amazing ability to get what you want. Use the “quick reference” format to easily browse through topics. Learn how to get the interview, get the offer and respond effectively. Plan a sound salary negotiation strategy and understand the employer’s mindset in a negotiation. Identify elements that give you power as a negotiator. Know when and how to tackle problem issues. Negotiate effectively and in a professional manner. Become more valuable to your employer or prospective employer. Get to a yes without coming across as greedy, selfish or aggressive.